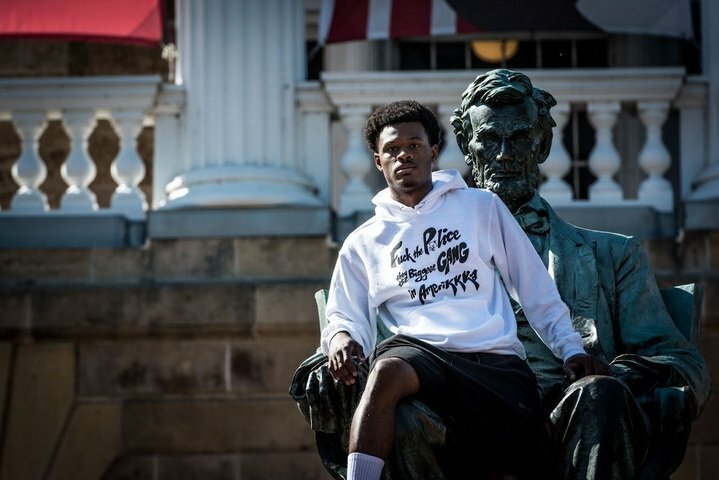 University of Wisconsin junior Eneale Pickett is no stranger to backlash. Tuesday, he released a 10-second preview of his video which sought to promote his new line of clothing from Insert Apparel and bring about discourse surrounding issues of systemic racism and police brutality. The complete line and full version of his commercial became available Friday afternoon. The initial announcement garnered nationwide attention, including that of a Wisconsin lawmaker. State. Sen. Stephen Nass, R-Whitewater, condemned his work in a press release as a “clear threat” to police officers and called for an investigation against him and involved students. 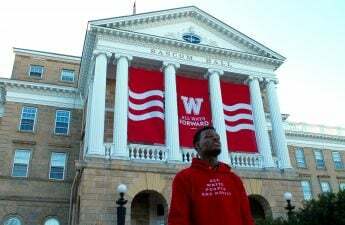 UW officials also commented on his clothing line, saying it was not affiliated nor endorsed by the university. 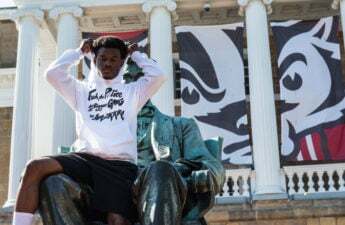 In a press release, UW said Pickett exercised his right to expressing his political opinions, although they disapproved of the violent images shown in his video. In the video, graphic images of a bloody pig’s head wearing a police hat, the hanging of a student with an American flag and a scene where two people wearing pig masks are chased by a student with a weapon are displayed. Pickett said the commercial was inspired by a dream he had several months ago — of six students laying down with one standing in the middle holding petals, symbolizing black bodies. This scene is replicated in the video. He was also driven by President Donald Trump’s comments on the Charlottesville riots to create the video. Throughout the commercial, soundbites of Trump’s speech on Charlottesville and chanting such as “White Lives Matter” and “Jews will not replace us” are heard. Instead of using music, Pickett said he chose to use Trump’s words to avoid diluting the message and highlight the president’s reluctancy in denouncing white supremacists. “These are the words of the president of the United States. This is who people elected, who people wanted to run the country and he won’t even denounce white supremacists,” Pickett said. 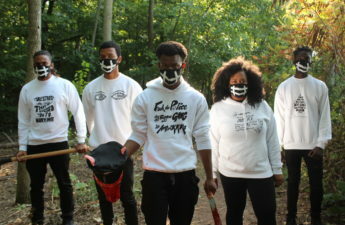 The students in the video are shown in masks, with hashtags painted in white to illustrate how hashtags are ephemeral and never fully formed, Pickett said. Some are painted lopsided to represent how hashtags always come and go, he added, including the names of those who lost their lives in police shootings. Pickett noted this new line of clothing is the most aggressive. He uses strong images to draw emotion and reactions out of his viewers. “You would never talk about something unless it hit you in your heart, in your face,” Pickett said. Ultimately, Pickett wants people to critically analyze the criminal justice system, and the disproportionate targeting of black and brown bodies by the police. His goal, he said, is not to change minds, but to make people aware of critical issues and create discussions around it. Despite highlighting issues specifically pertaining to the black community, Pickett reiterated the line is for all people — including people who do not identify as black. Other members of the campus community, however, are concerned about the violent images displayed in the video. 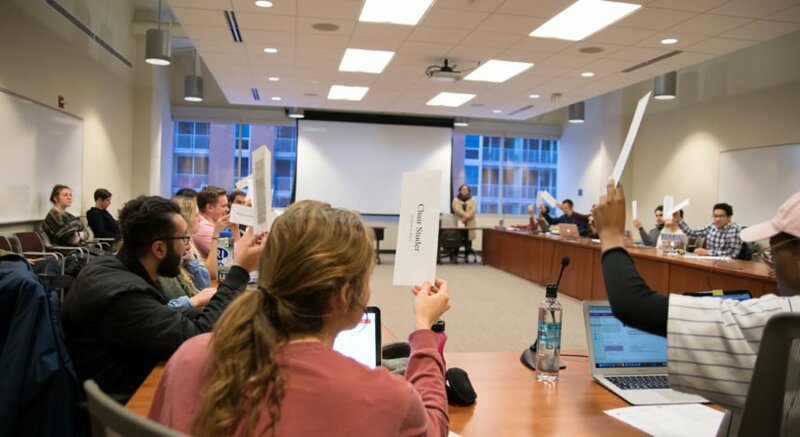 While Jake Lubenow, chair of College Republicans, said he understands the message Pickett is trying to bring forward, he ultimately disagrees with the way in which Pickett went about bringing about those issues to light in the video. “[The video] is very disturbing. 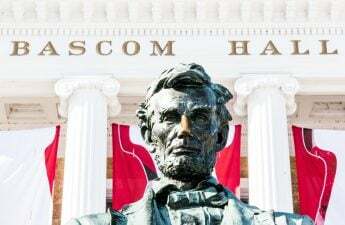 I understand the message of the Black Lives Matter Movement and the issues it brings up, but it is concerning for aunts and mothers who have students that go here and the message it brings about police officers now,” Lubenow said. On a similar note, Abigail Streu, chairwoman of UW’s Young Americans for Freedom, also understands the message of Pickett’s video and believes he brings up valid points of issues such as police brutality. Ultimately, though, Streu is concerned with the message the video contains against law enforcement. When asked how he hopes white students respond to this video, Pickett advised them to explain the meaning of the video to their peers if they understand it. Pickett noted the power of hearing information from people you relate to or share the same identities with, rather than someone of a different race or identity. Pickett plans on releasing a video explaining the meaning of his video Monday to avoid misunderstanding with his intent — this wait was intentional, so as to ensure viewers could process and form their own opinion.